This year, I have committed to writing three long-hand pages of brain drain daily that Julia Cameron named The Morning Pages. This week was hit and miss with getting my Morning Pages in. I think that the adrenaline had worn off from the mere pace of week one and my body was tired. I got my first day in and then over-slept the next three mornings. After the third time, a little guilt started to creep in until I set myself straight. The thing is, this tool is never intended to induce guilt. So, when I felt that inner disappointment rearing its head, I set it straight right away. 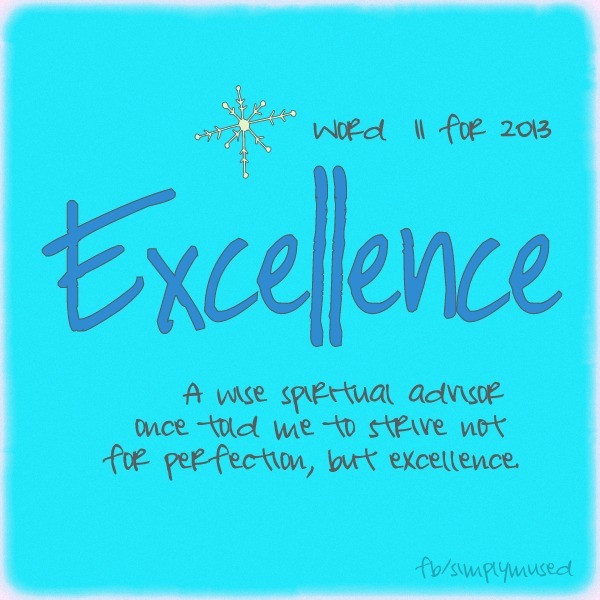 I reminded myself that I am here to strive for excellence not perfection. I won’t get trapped back into the perfection cycle. No. Never. Every day that I get these pages in benefit me. Even if I am not getting the optimal benefit, I am benefiting nevertheless. I did try to figure out what was going wrong. Reflecting back, I realized that the week was filled with resolving issues. My mind was alert and active and was able to analyze and execute tasks quickly. At work, I had to be prepared to be out of the office for an entire week, so there was much to do there. I finished with just enough time for my Artist Date. I also had several ongoing issues that had been concerning for a few years that presented themselves during my Morning Pages. In the affirmation section, I was able to see what my part and realized the action that needs to be taken as well. A couple of years ago, I got into the habit of saving the last third or fourth of the final page to write an affirmation. I believe that my mind needs closure at the end of all of that brain drain. This week, my affirmations were quite special and on one particular day it was as though I was more of a scribe than a writer. I love those days when the flow is so completely clear. My resolve is strong and I am excited to see what comes from my new found understandings. This entry was posted in Morning Pages and tagged clarity, creativity, journaling, perfection, resolve. Bookmark the permalink. I love the idea of ending Morning Pages with an affirmation. Sometimes I still feel agitated after my three pages (when I get to them! ), but this is a fabulous idea to end on a positive note when needed. 🙂 Glad you’re not giving in to the guilt/perfection monsters. Enjoy your weekend!